Having a coffee while working on a laptop at a café is how many people relax in their free time. This is the moment to ponder over deep thoughts or to simply find some tranquility to do something creative. many writers, and IT professionals use the opportunity of such an environment to work on their projects. 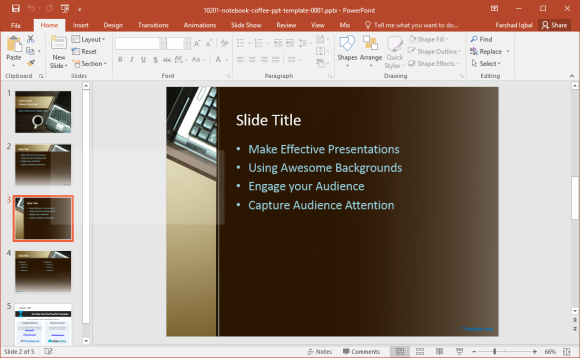 The Free Coffee Break PowerPoint Template can be a nice template to discuss the need for work life balance for stress management, to create a slide for announcing a break during a presentation or to ponder upon methods for enhancing productivity. 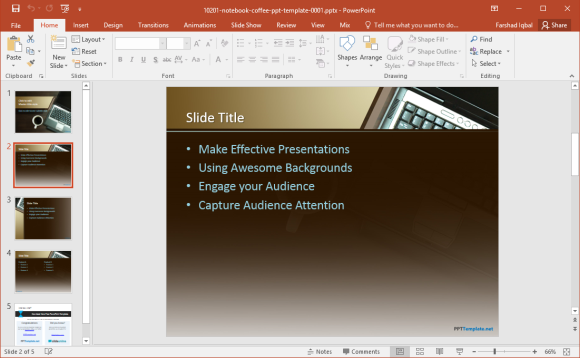 The slides in this coffee themed slide deck depict a laptop with a coffee mug placed on the table side by side. You can use this imagery to discuss the need for tranquility, breaks and peace of mind for enhancing productivity, achieving a balanced lifestyle or catching up with friends. You can also use this template with your presentation as a slide that shows up when a break is to be announced. You can add a time or related image to make the announcement more prominent, such as by adding instructions for your audience regarding the time of the break, the hall offering refreshments, return time before the start of the next session, etc. The template has a very basic layout, with scope for editing the default layouts according to your design requirements, making it more of a general-purpose template. 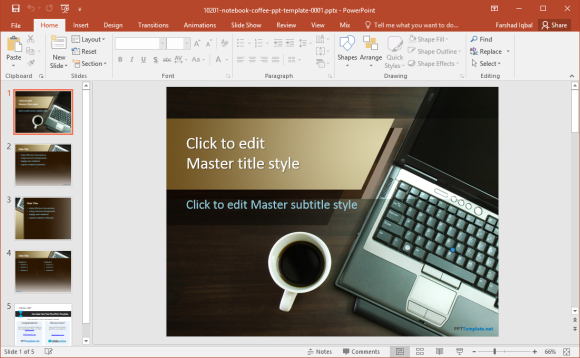 This is a PPTX template which makes it compatible with all recent editions of PowerPoint, especially editions released since PowerPoint 2007.